When it comes to having choices like this, it can make it difficult for a beginner to decide where to start. And as important as I think it is to explain the benefits of each of the above options, that post is not this post. 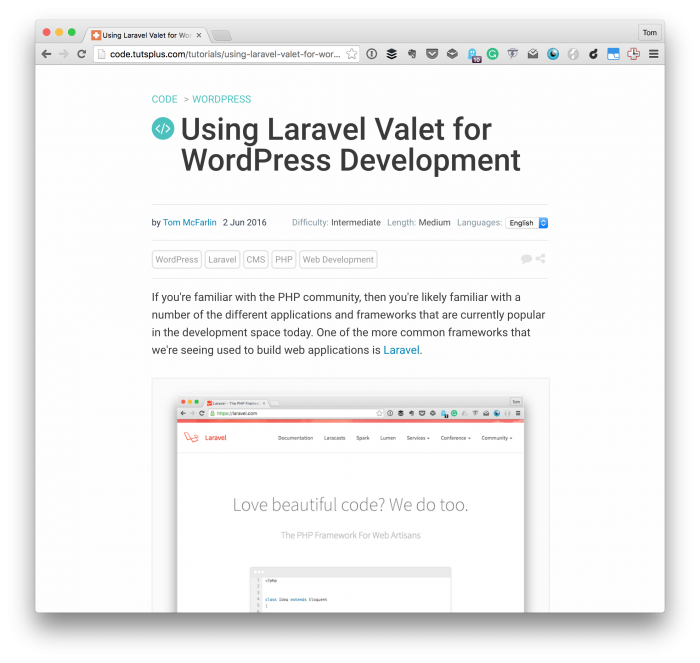 Instead, I want to share a short tutorial I wrote about using Laravel Valet for WordPress. Personally, I think Valet is a great solution for beginners, but it assumes a bit of familiarity with the command-line that might be off-putting to new users. Once you setup the software, it’s hard to argue against using it. So with that said, here’s how you can get started. As previously mentioned, there are a lot of options when it comes to setting up a WordPress development environments. A handful of developers will passionately argue about why a particular stack of software should be the one that we all use. But I’m of the mindset that our circumstances, clients, team, organizations, and projects help dictate the things we should be using. Without knowing all of these, it’s hard to provide a reliable option as to why you should be using any particular software over another. Aside from the setup process, using Valet is one of the simplest ways to get a development environment setup for WordPress development. It’s not without some of its challenges (which you’ll see later). For how, here’s everything you need to know as it relates to getting Valet downloaded, installed, setup, and having a test site launched on your local machine. So if you’re a WordPress developer and you’re looking for an easy way to get a development environment up and running without the use of some of the more common software (or some of the heavier software) that’s available, or maybe you’re just curious about getting started with something new, then perhaps Laravel Valet will be a suitable option. This reads like a lot of steps, but each one is broken down into simple steps, descriptions, and screenshots for how to get started with it. I also link to additional documentation and resources around the project that should help you got further with what you’re working and shoulder answer any questions. Ultimately, I’m a fan of Valet for WordPress for particular types of sites, but it doesn’t necessarily translate well for working with larger teams because of, say, needing to send box configuration to others (if that’s how your workflow works). On the other hand, it offers some great features like sharing your local site with a client where they can see everything running in action. I don’t think this negates the need for a staging environment, but it’s a nice, quick way to gather feedback before going to staging. At any rate, check out the article and feel free to leave any comments on the original article.